Michael van Gerwen outclassed defending champion Gary Anderson to win his second PDC World Darts Championship. Scotland's Anderson, winner in 2015 and 2016 broke the Van Gerwen throw to lead the favourite 2-1 after three sets. But Van Gerwen won 12 of the next 13 legs and, despite an Anderson rally, the Dutchman hit bullseye to seal it. Overall, Van Gerwen averaged 107.79, the best in a final since Phil Taylor beat Raymond van Barneveld in 2009. "I feel absolutely over the moon," said the 27-year-old, who won his first title in 2014. "My average says it all. "He put me under pressure and I missed a few doubles but I managed to come into the game. "I've been working for this because it's the most important one. We all fight for this really hard and I'm really glad I did the right thing at the right moments because Gary is a phenomenal player." Anderson was looking to join Taylor and Eric Bristow as only the third man to win three successive world titles in either the PDC or BDO. His average of 104.93 was better than in his 2015 final win over Phil Taylor and 2016 defeat of Adrian Lewis. He nailed 22 maximums to Van Gerwen's 20, but his checkout percentage of 37.78 was inferior to the number one seed's brilliant 44.26. "It's well deserved for Michael, but I've had a good three years," said Anderson. "At 2-2 I just started to drop and got punished." 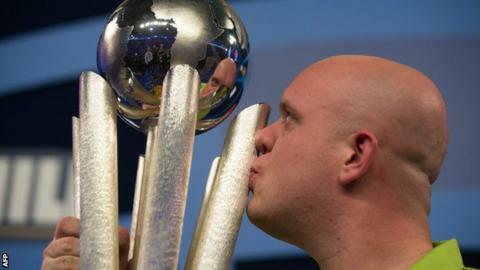 In winning a second title, Van Gerwen, who won 25 tournaments in 2016, becomes the fifth man to win multiple PDC world crowns since the organisation's first staging of its own tournament in 1994. He first threw for the match at 6-2 up, but was interrupted by a spectator who invaded the stage and lifted the trophy. Anderson went on to take that set, but Van Gerwen closed it out in the 10th to pick up the £350,000 prize money. "I worked really hard for this all year through," he added. "I've got great support from my family and this means a lot to me. This feels phenomenal." As two of the world's top four, Van Gerwen and Anderson automatically qualified for the Premier League, which begins in February, alongside Peter Wright and Lewis. Taylor and Barneveld have been handed wildcards and are joined by James Wade, Dave Chisnall, Jelle Klaasen and Kim Huybrechts.